A threatened district in DeLand beams again with a much-deserved face-lift. Phoenix Court stands at the center of the DeLand Garden District, its bungalows happily housing people who want to live close to downtown. If seeing is believing, it's probably best that Michael E. Arth agreed to buy his first houses in DeLand sight unseen. Even now, after he helped to transform a neighborhood on the fringe of downtown, the developer shakes his head in amazement. "I had lived in Hollywood, California, just under the sign with actor Keanu Reeves as my upstairs tenant," he explains. "Then I moved to Santa Barbara and met my wife. I've always had a passion for urban design and was always trying to design a better town. The Garden District presents me with a living laboratory of how to rebuild an existing neighborhood as a trial run for building a new town." The living lab appeared to be more a living something-else when Michael and his Bulgarian-born wife, Maya, arrived here from California in late 2000. "He was so excited that he drove right to the neighborhood even though I warned him to call me first," recalls Maggi Hall, a real estate broker and preservationist who initiated the revitalization project. "I opened my door, and there stood Michael and Maya. His face was as white as my shirt. I knew they'd already seen it." 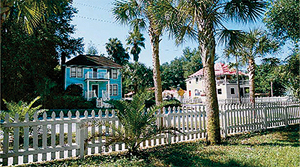 Picket fences and bright colors provide Garden District homes with a promising future. Their drug-dealer drab is a mere memory now. The neighborhood in question-known around DeLand as Crack Town-strutted its worst at night. Drug dealers inhabited the crumbling houses-and, needless to say, they didn't welcome urban planning visitors. "When we looked at it the next morning in the searing light of day, the vampires were back in their dens," says Michael. Indeed, the drug lords had landed themselves in the heart of DeLand's treasured past. "One hundred years ago, this was an upper middle-class neighborhood with fine, stately homes," Michael recounts. Then, with the urban flight pattern of the 1970s, the neighborhood sank into despair and cocaine. After moving into one of the former crack houses, Michael managed to buy 19 homes, but he had to fight off nightmares and threats at night. At her husband's bidding, Maya, pregnant with daughter Sophie, retreated to Bulgaria temporarily. Eventually the drug community got the message and did relocate. Michael, left with crumbling buildings and a sheaf of carefully drawn plans, energetically began stabilizing and shoring up the neighborhood, one building at a time. He put up white picket fences, painted houses bright colors, and hid parking off the street to encourage walking. With help from the city, he planted rows of palms where old oak trees once stood. Homeowner Gena Swartz and developer Michael E. Arth share a moment of happy triumph as yet another house moves toward restoration. Today, though the work isn't quite finished, the look and feel attracts buyers and renters alike. On a sunny DeLand morning, a few of the district's citizens gather to talk about their own investment. 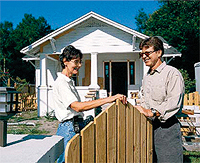 One is realtor Maggi Hall, whose daughter and son-in-law bought a house in the Garden District. Maggi invested in a whole cluster of homes herself, which led friend Gena Swartz and her husband to do the same. There are a total of 15 investors in the project. One thing that fueled Maggi's interest in the area was the city's plan to build a multimillion-dollar Intermodal Transportation Center in the troubled district. City leaders helped rescue the Crack Town, supporting efforts for change. Gena reports happily that one of the three houses she restored has indeed sold. She's entertaining ideas of moving into one herself, adding, "This is downtown living, like Mayberry. That was my inspiration." When Maya and Michael E. Arth arrived in DeLand, their current surroundings weren't the likely place to raise a daughter-but Sophie was born at home in the very neighborhood her father helped restore to glowing health. Others around the table nod. Jane Harris and Rick Hutchinson report getting frequent calls to rent apartments in the buildings they've restored. Rick, a home-improvement professional, agreed that the risk of taking on seven houses and the apartment building far outweighed playing the stock market. Everyone jumps in with tales. Janet Bollum, owner of a local bookstore, relates a horror story. "The house I bought had tunnels and a guy living in the laundry room. I filled up three entire dumpsters with things from that house." Michael looks on with pleasure. He calls DeLand home base, not just a business proposition. "I feel good now," he says, "especially when the flowers are blooming and the birds are chirping. I don't hear what I used to hear-very loud music from passing cars, people screaming, and gun shots." From guns to Garden District, the neighborhood's journey comes full circle with only good things ahead.